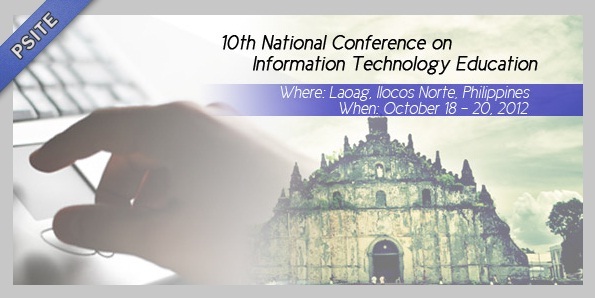 The Board of Trustees of the Philippine Society of Information Technology Educators (PSITE) cordially invite you and the IT faculty of your institution to the 9th PSITE National Convention. 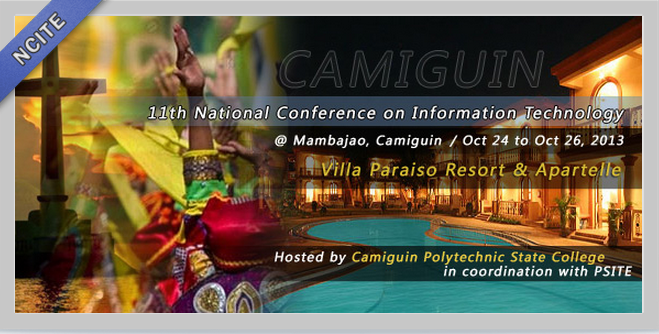 This will be on February 8-10, 2007 at Pines View Hotel, Baguio City. The theme of the convention is “LEARN IT: Learning Edge Applications, Researches, and Norms in Information Technology”. Please fax a copy of the validated deposit slip to Engr. Alex Ybasco at (02) 852-26-48. 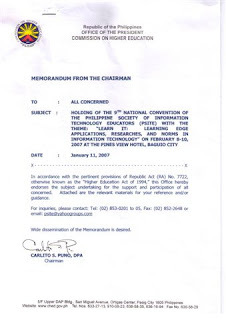 Alternatively, you may present the deposit slip to the convention secretariat on Feb. 8, 2007. Official receipts will be issued during the convention. Please confirm attendance through the PSITE egroup (psite@yahoogroups.com) or through Engr. Ybasco’s email address (mailto:edwin@addu.edu.ph). We hope to see you and your colleagues during the convention.